La Première features classic and elegant lines with a regular shape that closes on rounded end. The pure proportions match grains, rich in well-defined and delicately wiggly lines. Inlaid with Ebony and Maple in a ring encircling the end. The nib is made of rhodium-plated 18-750K solid gold with iridium tip. Made of two wooden versions: Bois de Rose and Ebony. Light, sinuous, with an oval shake end, the polka-dot pen features a traditional design created with Maple inlay in contrast with Ebony. With its unusual shake and colours, this pens is vivacious, whimsical, and balanced. 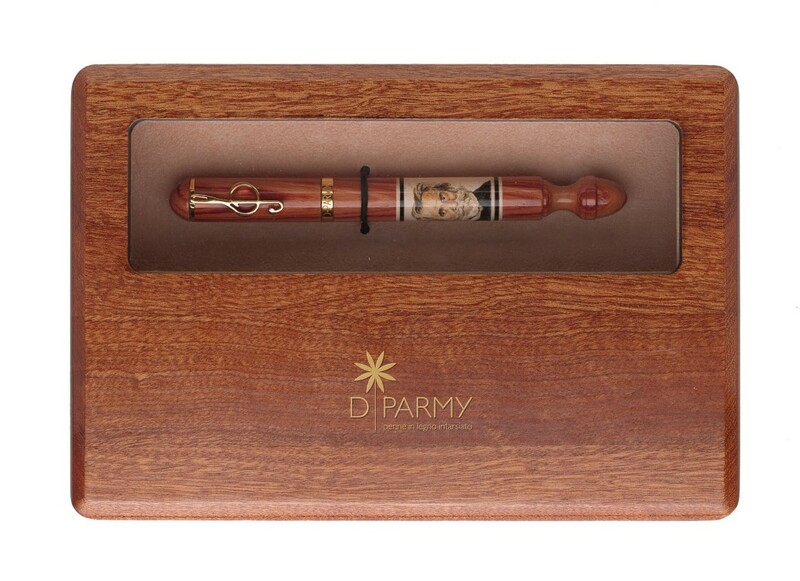 In celebration of the bicentenary of his birth, D-Parmy has created a special pen, in a limited edition of 200 fountain pens and 200 ballpoint pens. 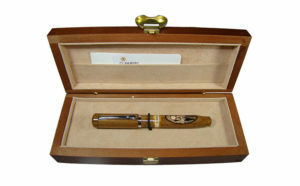 The body of the pen is housed in the elegant Bois de Rose. The portrait of the Master is hand painted on a maple inlay, along with his signature, year of birth and the bicentennial anniversary. A pine cone is carved on top of the pen; a recurring element in nineteenth century furniture that symbolizes vitality and rebirth. the architectural, artistic, political and economic magnificence of an empire, extended around the Mediterranean Sea, which absorbed eastern and western civilizations sapping continuously from them. Niches, arches and columns of one of the Roman architectural jewels have been rearranged in the 27 unique exemplars, inlaid, carved and painted by hand. D-Parmy with its new fountain pen dedicated to Michelangelo Buonarroti wants to celebrate one of the greatest and most important geniuses of the Italian Renaissance. The decoration of “The Creation of Adamo” by spray painting, entirely made by hand on each pen, commemorates Michelangelo’s art every time one makes use of it. The 6 one-of-a-kind pieces want to pay tribute to the genius Michelangelo Buonarroti, who was born the 6th of March 1475. With the extraordinary collaboration between D-Parmy and Fausto Bianchini, one of the best-known Italian Naïf painters, D-Parmy pays tribute to this as much beloved as acknowledged art. 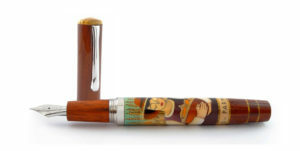 The decoration, handpainted by Bianchini on each pen, potrays a woman while hervesting corn. She is a feature of Bianchini’s Naïve art: with its distinguishing closed eyes and of generous proportions, the woman instills a sense of selfassurance and quietness and gives the abserver interior serenity. 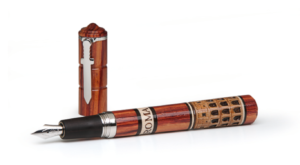 The 4 one-of-a-kind pieces, made of Padauk hardwood, inlaid with Smoketree wood through the fine handcrafted techniques of the D-Parmy tradition, are meant to pay homage to Bianchini and the art he represents. D-Parmy has conceived its new fountain pen dedicated to Abraham Lincoln with the aim to celebrate one of the best-beloved and bestknown politicians of the history. In the year oh his 150th death anniversary, D-Parmy pays tribute to him by crafting an extraordinary and unique item. The 15 one-of-a-kind pieces, made of Maple and Ebony hardwood with Bois de Violette inlay-works, have been manufactured thanks to the sophisticated handcrafted techniques of the D-Parmy tradition in order to celebrate the great politician. 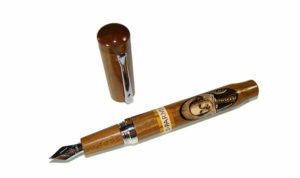 The central portrait of half-length Lincoln has been hand-made on each pen. Continues the extraordinary collaboration between D-Parmy and Fausto Bianchini, one of the best-known Italian Naïf painters, D-Parmy pays tribute to this as much beloved as acknowledged art. The decoration, handpainted by Bianchini on each pen, potrays a woman during the sunflower harvesting. She is a feature of Bianchini’s Naïve art: with its distinguishing closed eyes and of generous proportions, the woman instills a sense of self-assurance and quietness and gives the observer interior serenity. The 6 one-of-a-kind pieces, made of Padauk hardwood, inlaid with Ebony wood through the fine handcrafted techniques of the D-Parmy tradition, are meant to pay homage to Bianchini and the art he represents. For the 400th anniversary of his death (1616-2016), D-Parmy wants to celebrate one of the greatest playwrights in the history: William Shakespeare. Through a complex and perfect manual inlay work, D-Parmy succeeds in valuing the extraordinary elliptical Maple-wooden intarsia in which Shakespeare’s face has been painted by hand. The 6 one-of-a-kind, made of Palo Santo hardwood with intarsia made of Ebony and Maple wood, intend to pay homage to the poet through fine techniques of craftsmanship. D-Parmy created a new limited-edition pen dedicated to Giordano Bruno with the intent to celebrate the great philosopher who was brutally murdered on the 17th of February, 1600. Like all the man who early passed away, he had a sad fate. Sad was not only the unfortunate epilogue of his lifetime on the earth, but especially the impossibility to freely transfer his message to his peers. To create its precious item, D-Parmy has consulted Professor Guido del Giudice, acknowledged expert of the life and thought of the philosopher from Nola. D-Parmy gives value to the extraordinary intarsia through a complex but perfect handmade inlay work, whose Maplewood section portrays half-length Giordano Bruno painted by hand. The 17 one-of-a-kind pieces are made of Ebony and Maple hardwood, decorated with intarsia of Bois the Violette by using the refined handcrafted of the D-Parmy tradition: they represent an elegant tribute to the great philosopher taken as a symbol of the freedom of thought. 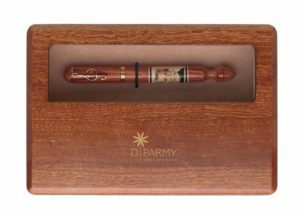 D-Parmy introduces its new Limited-edition pen dedicated to Wyatt Earp (1848-1929) with the intent to celebrate a character of Far West become a legend. Earp was a famous sheriff, buffalo hunter, gambler, horse thief and saloon owner in the wild American West. He was especially well-known for having taken part to the O.K. Corral shoot out with the brothers Virgin and Morgan and with Doc Holliday. His legendary figure inspired several western movies. D-Parmy, through a complex but perfect handmade inlay work, manages to enhance the extraordinary inlay, on which the face of Wyatt Earp has been hand-painted on Palo Santo wood. On the cap two guns have been painted by hand as a symbol of American Far West. The 20 one-of-a-kind pieces, made of Palo Santo hardwood, with Ebony inlay works thanks to the sophisticated handcrafted techniques of the D-PARMY tradition, are a fine homage to the legendary historical period he lived in. New extraordinary collaboration between D-PARMY and Brenno Benatti, one of the best-known Naïf painters and one of greatest contemporary ones in Italy. The decoration, made by hand by Benatti on each single pen, represent a landscape of the Po Valley countryside during wheat harvest. In Benatti, originating from Padania, the landscape is always humanized, cut and redefined as people-oriented, expressing will and fantasy of man. 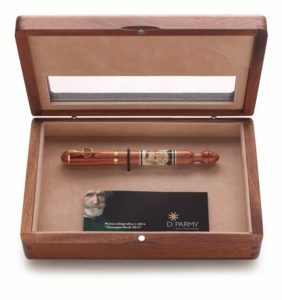 The 10 one-of-a-kind pieces, made of hardwood Smoketree, with inlay works of Bois de Rose, through the sophisticated handcrafted techniques of the D-PARMY tradition, are meant to pay homage to Benatti and the art he represents. Continues the extraordinary collaboration between D-PARMY and Fausto Bianchini, one of the best-known Italian naïf painters. 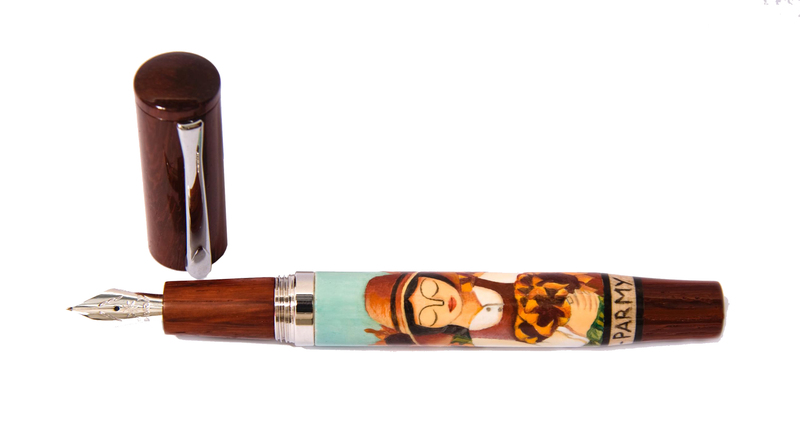 The decoration, handpainted by Bianchini on each pen, portrays a woman during the harvest of firewood for the winter. She is a feature of Bianchini’s Naïve art: with its distinguishing closed eyes and of generous proportions, the woman instills a sense of self-assurance and quietness and gives the observer interior serenity. Fausto Bianchini is one of the Naïf artists honored with the Gold Medal of the President of the Italian Republic in 1993. The 9 one-of-a-kind pieces, made of Ebony hardwood, inlaid with Smoketree wood through the fine handcrafted techniques of the D-PARMY tradition, are meant to pay homage to Bianchini and the art he represents. A new extraordinary cooperation between D-PARMY and Tamara Eramo, rising painter creating fine and charming artworks. The decoration, made by the artist by hand on each single pen, portrays a boat mirroring itself in the blue sea during a starred night. The thin hues, between the night sky and the sea, twist together on the pen barrel with strong and intense colors, which direct the glance of the observer toward the horizon hiding among the small and pale stars. The 13 one-of-a-kind pieces, made of Ebony hardwood with Bois de Violette inlay works following the sophisticated craftsmanship of D-PARMY tradition, want to pay tribute to Tamara Eramo and the art she represents. New extraordinary collaboration between D-PARMY and Marino Di Fazio, one of the best-known naïf painters in Italy. The decoration, handmade by Di Fazio on each single pen, portrays a winter landscape by night: his painting expression represents, with politeness and illusory simplicity and unquestionable candor, timeless fairy tales that “catch” the observer’s glance, direct it in themselves and make it part of the tale, of the dream, of the memory. The 15 one-of-a-kind pieces, made of Ebony hardwood with Padouk and Maple inlay works following the sophisticated craftsmanship of D-PARMY tradition, want to pay tribute to Di Fazio and the art he represents. D-PARMY is back to celebrate one of the outstanding empires of the history: the Roman Empire. Gaius Julius Caesar Octavianus Augustus, or shortly AUGUSTUS was the first great Roman Emperor. Augustus’ age represented a turning point in the history of Rome and the final transition from the republican period to the Principate. He governed until his death and his Principate was the longest in the history of imperial Rome (41 years from 27 BC to 19 August 14 AD). In over forty years of Principate, Augustus introduced reforms of crucial importance for the following centuries: he rearranged the new administrative system, he reorganized field and sea armies, he reformed the imperial boundaries’ defense system, he made Rome a monumental city by erecting several new buildings, he favored the rebirth of economy, he reorganized the monetary system and gave a new boost to culture. The 41 one-of-a-kind pieces, made of Ebony hardwood with Padouk inlay works following the sophisticated craftsmanship of D-PARMY tradition, want to pay tribute to Emperor Augustus. Pedestal made of real Italian marble. The great manufacturing project of D-Parmy pens dedicated to classical musicians is ongoing. D-Parmy pays homage to the great composer Wolfgang Amadeus Mozart, considered one of the most remarkable geniuses of the music history, gifted of a rare and precocious talent. He died when he was only 35, leaving a so deep emptiness that he was defined as “the most universal of all composers in the western music history”. Mozart’s music is considered the ultimate “classical music”: his main canons were harmony, melodic sense, elegance and imperturbable calm. The 35 one-of-a-kind pieces, with reference to his age, made of Ebony wood with Smoketree intarsia using the fine and advanced handcrafted techniques of D-Parmy tradition, are meant to pay homage to the great genius he represents. New extraordinary collaboration between D-PARMY and Giuliano Zoppi, one of the best-known naïf painters in Italy. The decoration, handmade by Zoppi on each single pen, portrays a summer hill landscape. Zoppi’s art of painting is benevolent symphony, relaxing and calming voice. His portraits rest on the memories of happy times, lose themselves to the childhood we have inside and that harmoniously wraps us up through its colors and landscapes. Zoppi is one of the naïf painters honored with the Golden Medal by the President of the Italian Republic in 1998. The 9 one-of-a-kind pieces, made of Palo Santo hardwood with Padouk inlay works following the sophisticated craftsmanship of D-PARMY tradition, want to pay tribute to Zoppi and the art he represents. The great manufacturing project of DParmy pens dedicated to classical musicians is ongoing. D-Parmy pays homage to the great composer Franz Peter Schubert, considered one of the most remarkable geniuses of the music history, gifted of a rare and precocious talent. Schubert was interested in a variety of forms and genres including opera, symphony, liturgical music and piano composition. It is surely in the Lieder (“songs” in German) where Schubert left, and still leaves, his mark. He explored the unexpressed markings of the genre with over sixhundred compositions, reaching remarkable results tending to more independent forms, just like the new Romantic movement. The 31 one-of-a-kind pieces, referring to his age, made of Ebony and Maple hardwood with Smoketree inlay-works, through the sophisticated craftsmanship of D-PARMY tradition, want to pay tribute to the great talent he represents.